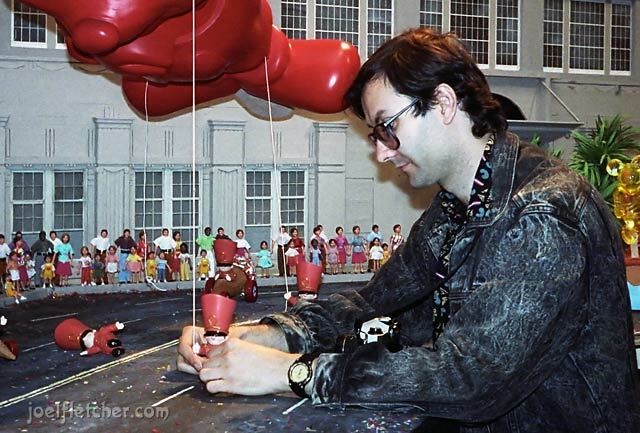 The project started out with the creation of numerous watercolor drawings of the characters and props by animator Don Waller, to be used as a design guide for the fabrication process. 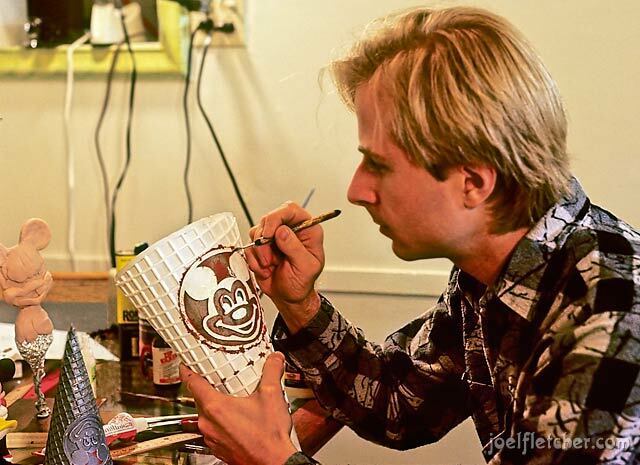 Then Don brought me on board to help sculpt the master patterns of the frozen treat props. 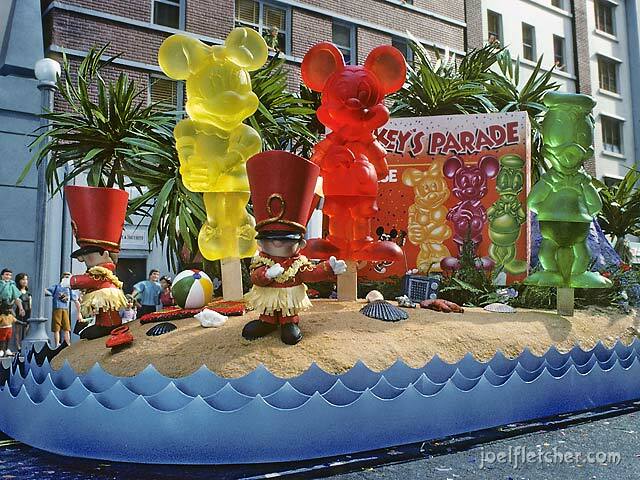 Don made the Mickey Mouse and Donald Duck popsicles, plus the parade character with the big hat. 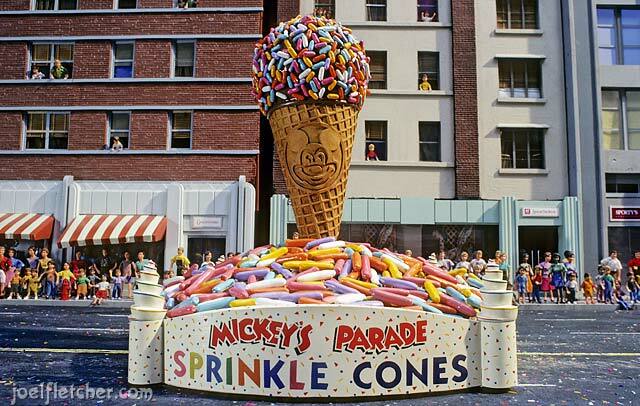 I handled the Minnie Mouse popsicle, and small and large versions of the sugar cones. The figures were made of sculpey, a polymer clay that bakes hard in the oven, while the cones were constructed from plastic mesh, cardboard, and modeling putty. The sculpture mission was to duplicate the look of the product box art. 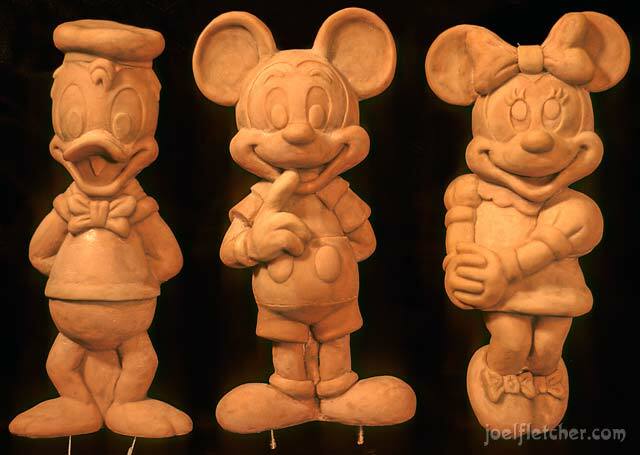 Our sculpted prototypes had to be approved by the Disney product division to insure they were on-model and met the Disney standards, but they wanted only minor changes to pass their quality control. 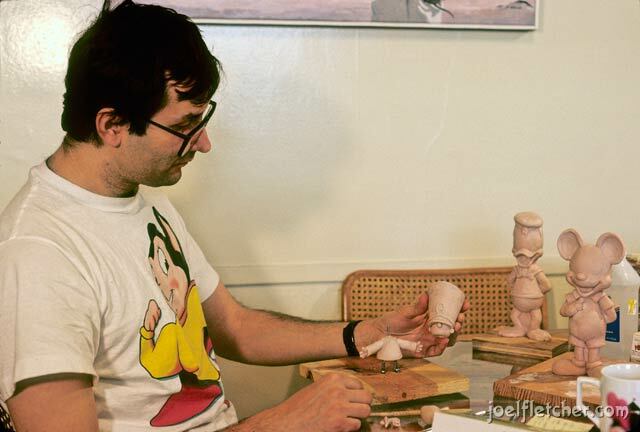 The completed sculpts were then handed off to stop-motion fabrication expert Niki Matthews, and the model makers at Gregory Jein, Inc. for molding and casting. When the fabrication work was completed, the animation shoot began at the Chandler Group stages (now New Deal Studios) in Marina Del Rey. 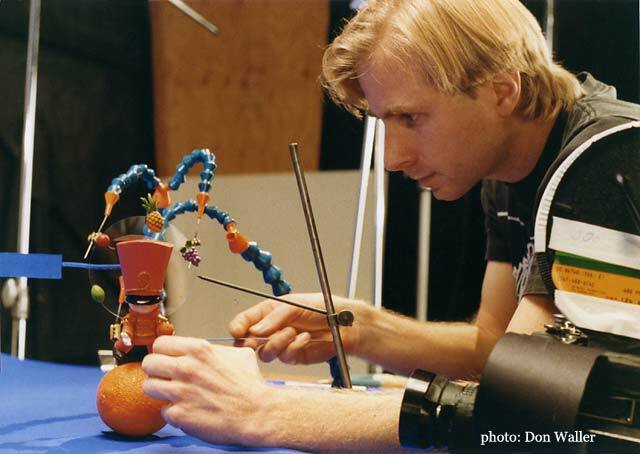 For us animators, the incredible puppets and props were like new toys at Christmas time. Each shot varied in complexity, but they were all difficult due to the sheer number of characters and objects to move. Fortunately director Kevin Dole figured out some time and effort saving rigs to help us poor animators out. Many of the large groups in the parade were connected together so they could move as one. 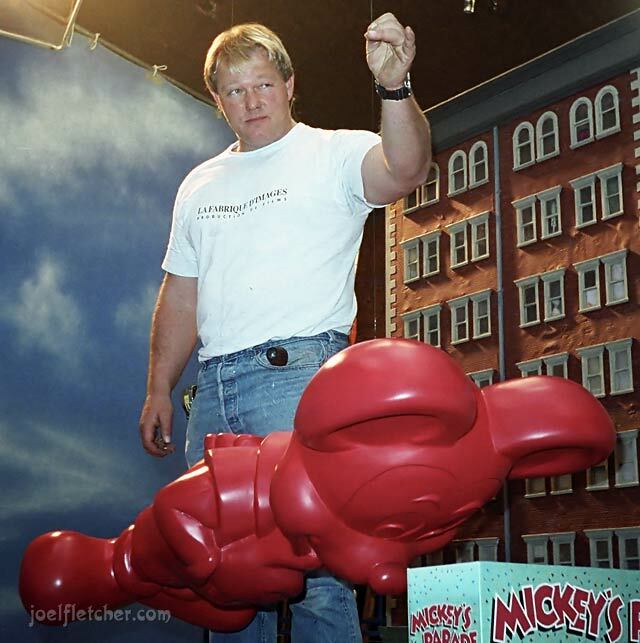 The big Mickey overhead ballon (sculpted by Douglas Turner) was connected to a motorized motion-control unit, so we did not have to deal with it at all. The background spectators were made of dolls that conveniently had wire in their bodies. 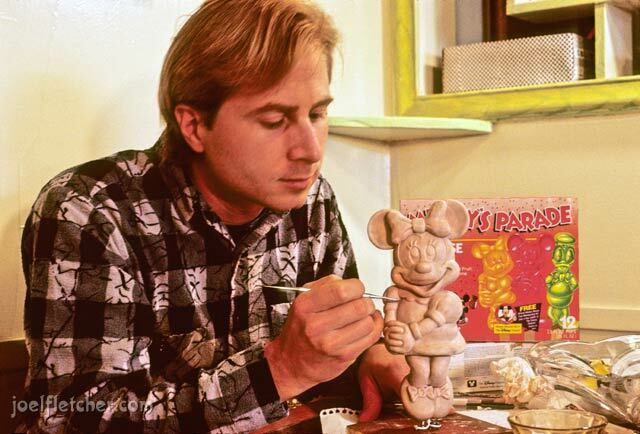 Most of them were animated by hand, but some were rigged with a device that moved many at the same time. In order to allow access to the set, the buildings were mounted on precision rails. The buildings would slide away for animation, then moved back into place before each frame of film was exposed. By the way, those buildings had a history. They were repurposed models from movies such as Blade Runner and It's a Mad Mad Mad Mad World! Which seemed appropriate since this commercial was crazy! Don and I were the main animators on the shoot, assisted by Rich Kinney. For one or two of the bigger shots we brought in Kim Blanchette as an additional animator. The camerawork was expertly handled by cinematographer Tim Angulo and motion control operator John Higbie. There were so many objects to animate, notes were taken so we would not forget what all the characters were doing. Each shot took a very long time to complete due to all the complexity, and fortunately there were no re-shoots. There was one additional shot that I animated on a blue screen stage, of a character juggling fruit while balancing on top of an orange. I used special rigs to support the man and the juggling fruit; it was a difficult shot but almost easy compared to the parade shots. In post production, Kevin Dole composited the juggler between two shots as a wipe. Falling confetti was also composited over all the animation for extra dimension and eye candy. Close up shots of real spectator children were intercut with the animation, which worked surprisingly well. 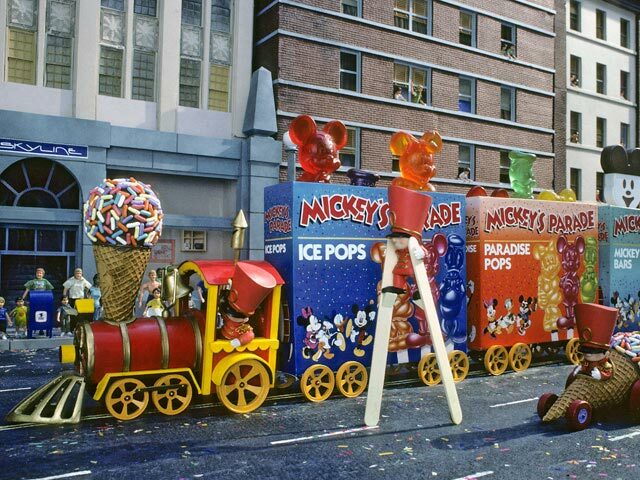 The Mickey's Parade ice cream products are long gone, and the advertisement is now a distant memory for all who saw it. However, the commercial was an outstanding stop-motion and artistic achievement for its time, and worth another look 21 years later!